Jesus goes all-out when it comes to love. His powerful healing restores our well-being and relieves our pain. Lavish generosity provides for our daily needs and heart’s desires. His wisdom and truth guide us through life’s tough choices. He fills our lives with eternal purpose and meaning through spiritual gifts and personal callings. Jesus’ sacrifice of his life on the cross is the ultimate expression of his love for us. He stops at nothing to show his devotion in every part of our lives. Yet even as I stand in awe of Jesus as he rescues, heals, and provides, it’s his tender attention that draws me to him. It’s reassuring to my heart to know I’m seen. Heard. Noticed. It’s in Jesus’ intimate attention that I realize how loved I truly am. Jesus’ love for his people sets a perfect example for my husband and me. His kind of attentive love is life-giving to our marriage. To grow a deeper relationship, we need to move beyond grand, romantic gestures and simply notice one another. 1. It’s the little things. Pour a hot cup of coffee to say “I love you” on a chilly morning. Take a moment to charge your spouse’s phone or fill their gas tank. Wash a sink full of dishes or make the bed without being asked. Run out to the car when you hear the garage door open to help carry in the groceries. Give a soothing shoulder rub at the end of a stressful day. Small, thoughtful favors can make a big statement to your loved one. Compliment a new haircut or the way a sweater brings out the color of your spouse’s eyes. Mention the ways you’re attracted to one another, no matter how long you’ve been together. Take note of physical signs that your spouse is suffering from stress or fatigue. Put down your phone and make eye contact, giving undivided attention in your conversations. Turn your eyes onto your spouse to recognize what makes them one of a kind and what they’re going through. Work, kids, and busy schedules seem determined to keep every couple apart. Commit to breaking away for time together on a regular basis. Spend a couple of hours talking, listening, and catching up. Hear one another’s struggles and dreams for tomorrow. Pay attention to words like “I wish,” “I want,” and “I wonder,” so you can make your spouse’s needs and hopes a reality. And, receive any complaints or frustration you hear with a humble heart that’s ready to change and grow. 4. Look for what’s lacking. Perhaps your wife is spending the entire clothing budget on the family and neglecting herself. Maybe your husband is giving up his gym time to attend the kids’ soccer practices. Count the exhausting hours spent awake in the night, caring for little ones. Check the calendar—how long has it been since your spouse had time to hang out with friends? Keep your eye out for unmet material or emotional needs and look for ways to relieve them. Offer a tender ‘hello’ and ‘goodbye’ when you’re coming and going. (Throw a hug and kiss in there, too.) Recognize your spouse’s talents so you can brag on them to your friends and family. Text through the day just to check in or flirt a little bit. Say ‘thank you’ for all the ways you’re cared for, helped, and supported each day. Step aside to pray together as issues come up during your week. Take every opportunity to express out loud that you’re on each other’s mind. In our heart of hearts, we long to be seen. 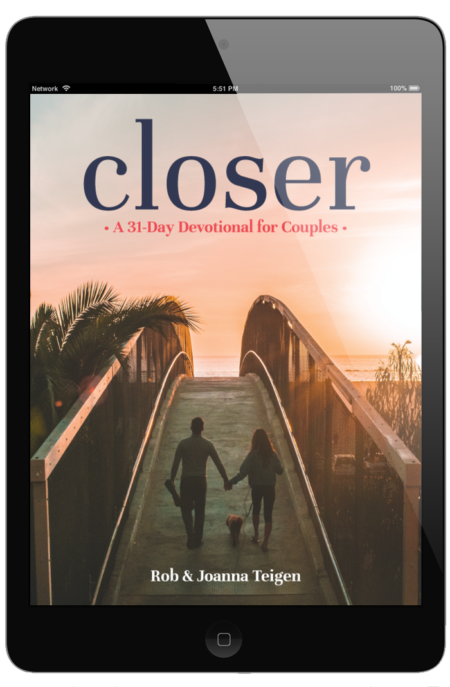 When other people, activities, and goals win our full attention, it says our marriage has sunk to the bottom of the pile. Apathy and indifference are even worse than a fight—conflict can at least stir up emotion and get us to talk! Today, pray and ask God for eyes to notice and truly see one another. His Spirit will enable you to see as he sees—with constant, attentive love that notices every little thing.